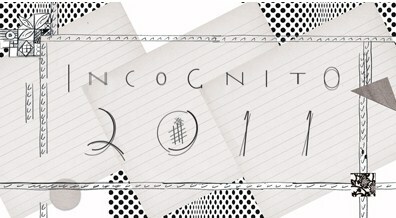 For 7 years the Santa Monica Museum of Art has hosted “Incognito”-a benefit with a unique twist. This weekend, over 500 artists donated original 8″x10″ works and patrons got the opportunity to nab original works at $300.00 a piece. Love Baldessari? You’re in luck, he frequently donates his work-so does Ed Ruscha. 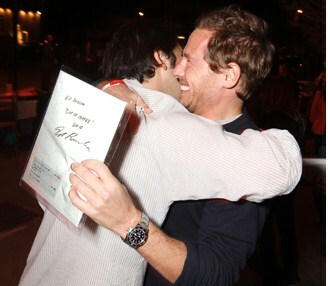 The egalitarian nature of the show is a lure for new collectors. All you rely on are your eyes, your gut and your credit card. Ultimately, primitive compulsions “to win” creep in and human nature fuels an obsessive desire to secure optimal pole position-even at a benefit. 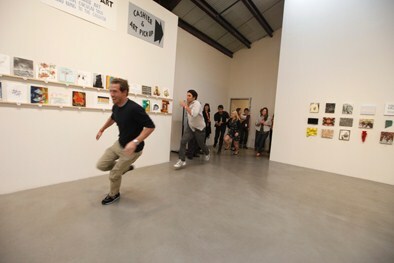 When I looked at pictures from last year’s Incognito, I saw this image of young collectors running into the gallery. Wow, who would have thought the art world would require such athletic vigor? Why would one go running into the gallery unless they were sprinting to get to their favorite piece? How would they know where it is? Well, the event has different ticket levels, so the more you donate up front, the more access you get to the works via previews and advance admission (i.e., optimal pole position). If that seems cost prohibitive, you can always go the next day for Incognito’s 2nd Opportunity Sale. This is where the remaining works are still available for $300.00 each, sans the party and the crowds. Unfortunately, the scene is more like last call at a bar. You desperately look around for something to take home but all the good prospects are gone, and what’s leftover are the hopeful castaways surrounded by a sea of red dots and empty wall space. If I were an artist I wouldn’t want my work shown like that, however I abandoned all concerns of artists’egos as I spotted one piece painted on a small, scalloped paper plate. I suppose that if you’re going to be cheeky enough to paint something on a disposable paper plate, you don’t concern yourself with trivial questions of whether someone runs or saunters up to buy your work. Nevertheless, I think Incognito could do something more dignified with the leftovers-maybe give them to future donors at the $300.000 level. Ultimately, I think the only good leftover is my black bean chili. In the meantime, I’ll save some $$$ and get into sprinter’s shape for Incognito 2012. Look out Santa Monica, I’m throwin’ bows!